Top 10 lists are everywhere, aren’t they? Today I even came across a list of ‘top 10 ways for making a great list’. But I have a top 10 list that is pretty special. It’s the culmination of a project in which people mild-moderate hearing loss, their families and friends, clinicians in the field and their representative bodies, came together to identify and prioritize uncertainties for research. 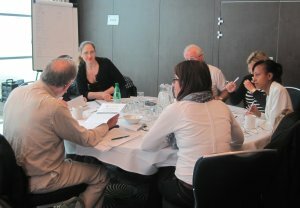 I was delighted to be part of this process, which unfolded over the past year, representing Cochrane UK on the steering group but also bringing to it my own experience of living with moderate hearing loss. Finding out what matters most to people affected by a condition and making that knowledge available to guide future researchers is what James Lind Alliance Priority Setting Partnerships (PSPs), like this one, are all about. I wrote about the early stages of this one here, earlier this year. So what happened next and how did we get to the top 10? Survey 1: opening the floodgates! This was shared as widely as possible and asked people to submit their questions about the prevention, diagnosis and treatment of mild-moderate hearing loss. 461 people sent 1,147 suggestions! The researchers at the NIHR Nottingham Hearing Biomedical Research Unit (NHBRU) grouped and tidied these into indicative research questions and identified which were true uncertainties by checking them against existing research. 87 questions went on to the next phase. This asked people to rank these 87 questions on a scale from ‘not a priority’ to ‘very high priority’. The top ranked 30 were then thrashed out at a workshop, earlier this month, where patients, family and friends, and clinicians agreed upon the top 10. This was a fascinating process. 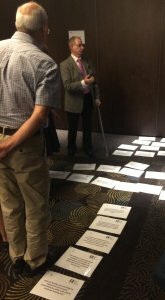 I rather enjoyed the combination of high tech, like the fancy gadgets two of us were using to assist our hearing aids, and low tech, the laminated cards displaying the 30 questions which we laid out on the floor and moved around as our discussions progressed, to discuss future tech! The question ‘can new technologies replace hearing aids?’ generated some particularly interesting discussion and it was a good example of the usefulness of pooling the knowledge and experience of those with hearing loss and professionals in the field. This is what we chose as the top 10. What adverse effects are associated with not treating mild to moderate hearing loss in adults? Does the early fitting of hearing aid(s) result in increased patient benefit and/or improved cost-effectiveness of the service? Does the early fitting of hearing aids slow the rate of cognitive decline? What are the reasons for low hearing aid uptake, use and adherence? Can new technologies replace hearing aids? Can stem cell therapy offer a cure for mild to moderate hearing loss in adults? Does early identification, diagnosis and treatment of mild to moderate hearing loss prevent further deterioration of hearing? Could new developments to digital hearing aids offer improved speech perception in noisy environments? How realistic are hearing tests for assessing the everyday hearing abilities of adults with mild to moderate hearing loss? Could the use of real-world sounds to help program hearing aids in clinic (rather than tones or beeps) improve hearing aid effectiveness? I’m sure I wasn’t alone in feeling the weight of responsibility for getting this list ‘right’ and in our discussions we also paid close attention to the ‘near misses’, which ended up as questions 11 to 15. The diversity of the questions felt challenging. David Crowe, JLA Co-ordinator, reassured us. 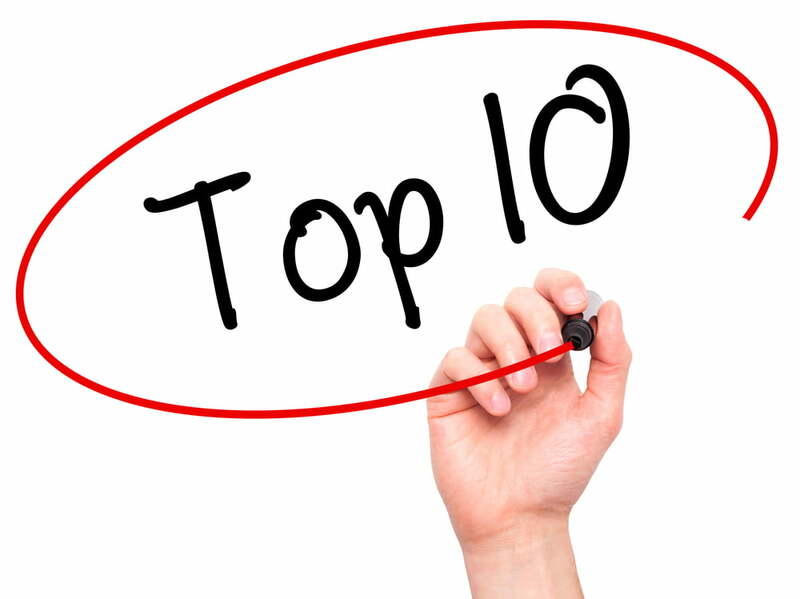 “The final top 10 reflect a good balance of prevention, diagnosis and management questions, and will be disseminated as widely as possible to influence future research decisions”. It was also good to hear that whilst the top ten are the showpiece of this project, the other true uncertainties we identified will also be made available to researchers and funders. The top 10 are being sent to commissioners, funders and policy makers and the long list of 87 questions will be added to the UK Database of Uncertainties about the Effects of Treatment (UK DUETs). 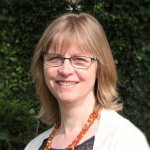 Longer term, Helen and colleagues at the NHBRU will aim to develop a programme of research that addresses some of the top 10 uncertainties. They might also revisit the suggestions that didn’t make it into the prioritization pool. Our top 10 joins the lists generated by other PSPs, addressing a variety of conditions from asthma to stillbirth. You can find out more about those here. Top 10 priorities for research on mild-moderate hearing loss by Sarah Chapman is licensed under a Creative Commons Attribution-NoDerivatives 4.0 International License.